I consider myself to be one very lucky teacher. Every year I get a new crew of kids and I think I’ll never love them the way I loved my previous class, and every year I learn that (much like being a mother) your heart can expand to fit more and more kids within it. I love my students, I call them my kids, and my kids they will always be. Those two girls were both former first graders of mine and both have kept in contact with me since they were in my class. These pictures represent times that these girls wanted to include me in their lives outside the classroom long after they were in my class; as a speaker at her Bharatanatyam Arangetram, and visiting another while she worked. Both events made me so proud of how these two have grown, evolved, and changed since they were in my class. Over the years I’ve been lucky to have many relationships last long beyond their tenure in my classroom. On the first day of school this year I had emails from 12 former students, ranging from high school seniors to sixth graders I had last year. When I think about what makes these relationships last, what makes these kids still see our classroom as a place they can call home, I think it’s a combination of a few things… all of which are so small, but add up to a lasting impact. 1- “Relationships First” is not just a cute phrase or hashtag on Twitter. It’s the driving force behind my teaching. There are definitely teachers out there who are more talented than I in the craft of teaching, who have better anchor charts and flipcharts, better lessons and assignments, but I know my kids always know that to me they are #1. 2- I show that I’m human. I admit my faults and my wrongs, I apologize if I overreact, I check back in if I think I hurt a kid’s feelings, and I write private notes to kids who maybe need to know that I’m here. I share stories about my kids and my husband, I show videos of my kids and their silly antics, I read books that were my actual physical books when I was a child and share the pages that made me swoon. I tell them about my dreams and fears and I model my beliefs every day. 3- I respond. If a child reaches out to me in email, I respond immediately. If they write me a note, I write back. If they draw me a picture, I hang it up. I’m also human and sometimes I forget. Then see #2- I say I’m sorry and fix my errors. 4- I use humor. Everyone is different, but my kids get to know me and my humor. I can be silly and dramatic, I overemphasize and act out my feelings, and we all laugh… every day. Kids like to laugh. I like to laugh. It works! 5- I like them. I have never met a kid I don’t like. The most challenging kids I’ve ever had are the kids who carve their way into my soul. They keep me up at night years later wondering where they are and how they’re doing. That doesn’t mean I don’t struggle, that there aren’t kids who bring me to my personal brink, but when that happens I step back, often turn to humor, and also give space. A whisper of “I care about you and know you are better than this behavior. Let’s take a breather and come back when you’re ready” can solve more problems than I can count. Even with the toughest kids. There is no magic formula that leads to lasting relationships, but if at the base of all of your interactions is a belief in mutual respect you will be golden. Respect kids time, respect kids space, respect kids lives. They don’t all come to us with Brady Bunch parents, three well-balanced meals, and a fully stocked library in their homes. Some of them come to us from chaos and school is their safety. Some of them come to us having it all but still need just a little bit more. You don’t have to be a superhero to create lasting bonds- you just have to care. Every day. No matter what. 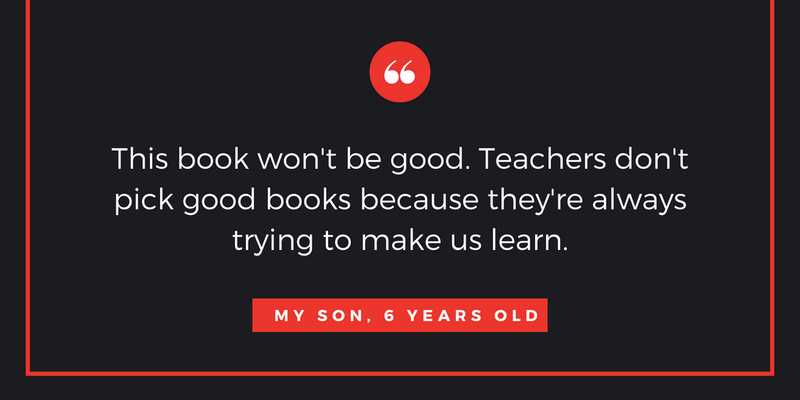 Kids can tell, and kids deserve it. Before I even begin, I must tell you that when I read this book today TWO classes of 5th graders clapped at the end. I’ve been teaching 5th grade for a long time and I can’t recall many times kids clapped at the end of a book, but this book literally brought the house down- TWICE IN ONE DAY! When I think about why… why was this the book that made them clap, the book that so deeply resonated with two separate classes- I think the answer is two-folds. On one hand my kids can so relate to Sangoel, but also Sangoel is just such a lovely character. He is composed and calm at times when he is frustrated, he doesn’t give up on who he is, and in the end he gets his whole class to say his name properly- he’s winning! Most of my students are from India and have traditional Indian names. When I asked them today to raise their hand if someone has ever said their name wrong most hands went up. I then asked them to keep their hand up if they have ever gone a whole year in school with their name being said wrong every single day. Most of the hands stayed up. When I asked why the answers were as I expected- they felt too shy to tell the teacher, they didn’t want to be disrespectful, they tried to tell them but the teacher still didn’t say it right, and more. What I find with my students is that most say, “It’s ok, say it the way you said it, that’s the American way.” But when we do that, when we accept the American way as “good enough” because the kids told you to, you are robbing them of their identity. I’m not going to pretend I can say all their names right- I have a few I’m totally butchering, but I told them that their job is to help me, daily, until I get it right. I go over to them quietly and have them help me. I practice and practice, at home looking at my roster, and in the classroom next to them. I am not going to rob them of their identity by accepting their permission to call them their “American name” when I know it’s not their real name. What made Sangoel so incredible was that he held strong. He thought outside the box and found a way to show his classmates and teacher how to say his name. He also opened a door for deep, rich conversation with my students as we discussed the importance of our names. Sangoel provided my students with a safe place to discuss a topic that they often are too shy or embarrassed to discuss because they don’t want to correct their teacher, but when we discussed this concept through Sangoel, they were so incredibly comfortable sharing their stories. And that, my friends, is the power of diverse children’s literature and why it matters. Not only does it show representation, but it allows conversations to naturally occur in a safe space. Kids deserve it.